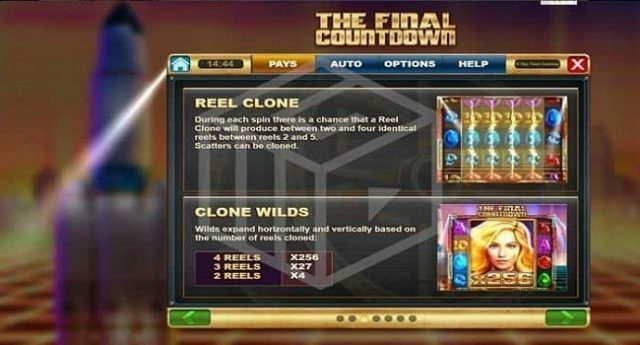 The Final Countdown is a 6 Reels and 4,096 Paylines slot game developed by Big Time Gaming, the world’s largest online casino game developer company. The Final Countdown video slot is playable across every device including mobile and smart phones with coin sizes of 20p to up to 20 per spin. This slot is inspired by a Sweden based rock group named Rockers Europe and on their classic 80s hit The Final Countdown. The game contains many wilds as well as 2 free spin features one is The Countdown Free Spins feature and the second is Heading for Venus Free Spins feature. There are a total of 4 Bonus rounds available in the game. As mentioned, the Final Countdown slot is inspired by music and on a rock group and it means you would see musical symbols all over the reels. There are lower value symbols as well as some high paying symbols available in the game. The purple jewel is the highest paying symbol of this game which pays you 25 times of your total stake if you land 6 of these symbols on 6 of the reels. Reel Clone feature – The reels can clone on any spin from reels 2 through to 5. Clone Wilds feature – The wild symbol landing on any cloned reel will expand and will give you 4x, 27x or 256 times of your total bet. The Countdown Free Spins feature – if you choose this feature then this feature will get you 8 free spins. You can also get much more free spins added to your account if you land countdown scatter. The feature offers a multiplier of 256 times of your bet. Heading for Venus Free Spins feature – If you are choosing this free spin feature then you will receive 15 free spins and if you are lucky to land velocity wilds on the reels then you will receive a multiplier of anywhere from 4 and 888 times of your total stake. The Final Countdown slot machine from Big Time Gaming is a superb example of how an online slot can be very entertaining. This slot has everything that you need while gambling. You can win a maximum of 36,000 times your stake.